"He's a little bit crazy... you know, in the fun kind of way." That was my introduction to Rick Armstrong, the phys ed teacher from Granby Elementary and the driving force behind Gators Bike Park. And I'd have to agree. When I met him, I was blown away by his energy and passion for what was happening at Granby Elementary and the Gators Bike Park. Personally, I like people who are a little bit crazy. They're more fun. More interesting. And every now & again they do stuff that's just AWESOME. The story of Gators Bike Park is really about awesome people doing awesome things. The trail, billed as a community bike park, is on a little corner of land beside Granby Elementary. Not much more than an unused tract beside a parking lot, behind a building, next to a fence. It's kinda swampy. Nobody in their right mind would think to put a mountain bike trail in there. But Rick & a dedicated group of volunteers did. Rick is quick to give credit to a whole host of volunteers who have brought the project to life. Parents were quick to jump on board. Fellow educators loved the idea. An incredibly supportive Principal Patti Schlaegel has been a champion of the project. The volunteers of COMBO have helped with trail-building. Wheelie Fun Bike Shop in Powell has adopted the program by helping maintain bikes. Many folks have donated out-grown bikes to the school... and the list goes on and on. In many ways, the project isn't about the trail as much as it is about an amazing community coming together to do something special for kids. Longer trails are problematic for beginning riders. As they approach an obstacle, they may or may not nail it. The real challenge is that they typically only see it once. One of the subtle benefits of a trail like Gators is that it's so short. Here's what I mean: the first time I took my kids to ride Gators, it was amazing to see how quickly they developed as they rode the course. Unlike many mountain bike trails, Gators is short. Really short. My 9 year old rips sub-60 second laps. For older riders, that might not sound like much fun. But for small or novice riders it's perfect. After riding around an obstacle a few times at first, kids tend to challenge themselves. 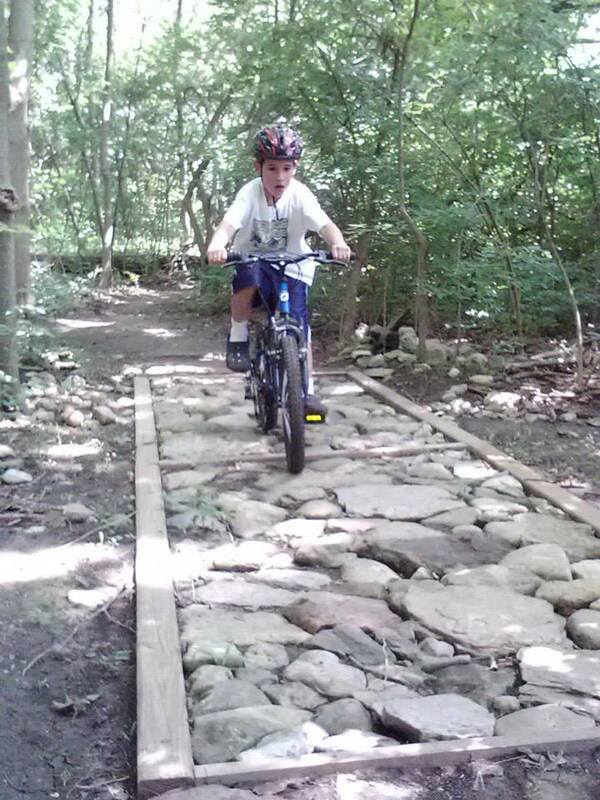 As the kids ride the trail, there are options at each obstacle: you can go over the logs or around them. The first time by, my kids went around. The second time by, around. Third time, around. And then a funny thing happened after riding by that same obstacle & looking at it repeatedly; they both went OVER the logs on the fourth time. My daughter beamed, "I did it!" Repetition. Confidence. Smiles. Each successive lap, the kids got faster and experimented with different lines over and around obstacles. All the features at Gators are low risk so if they do need to bail, it's no big deal. They just ride off the edge of a skinny or can stop & put a foot down in the rock garden. They know full well that they'll see that challenge again in about a minute and their determination naturally grows. It's this repetition that makes Gators such a great learning environment for young shredders. Within just a few minutes, my kids were riding all the obstacles: a low skinny, the rock garden, the log over, the double roller. They loved it. And I was a believer in Rick and Gators and the Granby Elementary community that brought this special place to life. Be a little crazy & go for it. Rick, the Granby volunteers and the Gators Bike Park are amazing examples of awesome people doing awesome things in their community. This happens to be about mountain biking but for me, the greater example of people having an idea & going for it serve as inspiration. We could all be a little more crazy about taking an idea, injecting passion and enthusiasm and building something for the greater good of the community. That's the main reason why I'm such a big fan of Rick & Gators Bike Park. They're making a difference in their community and it's a beautiful thing to see. Gators BikeFest, May 2nd, 2015, 4pm. If you're looking for a great event for your kids and would like to give Gators a try, BikeFest is coming up on May 2nd at 4pm. Head on over to Facebook and "Like" Gators Bike Park to find all the information about this event. Pro Tip: Smuggling more cycling parts into your stash without getting caught.